On my last day in San Francisco, I met up with a friend of a friend, Gaynor. It was a blind friend date, if you will. 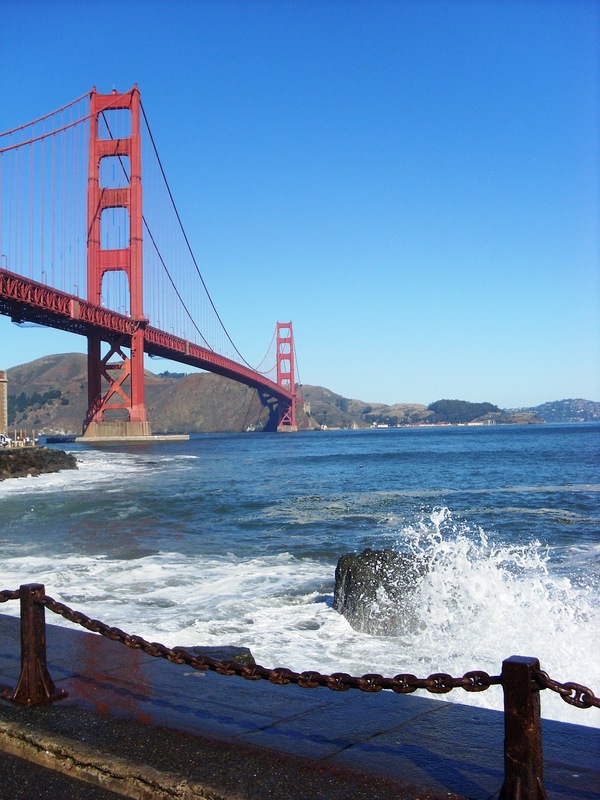 I was fairly sure we'd get on - my friend had lived with her for years, in Jersey and then in San Francisco, and I'd heard plenty of wild stories about her over the years. She picked me up from a bar over near the Golden Gate Park, and took me down to a little sports bar on Pier 23. I should point out that I wasn't on some crazy day long drinking binge. I was seeing a friend who works there for the last time before I left. So I left my friend's bar and headed off with my friend's friend to another. You see? I do have friends. There's at least two in that sentence. Down at Pier 23 spirits were high. A few nights before, the Giants had won the World Series, something that hadn't happened in 600 years, or something. The city went crazy. People were high fiving strangers in the street (which is great for me, as I love high fiving) and horns were honking long into the night. 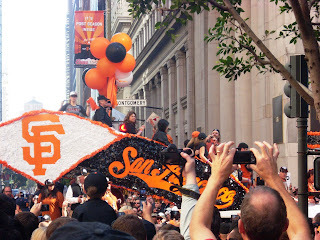 That day, the winning team had paraded through the city. 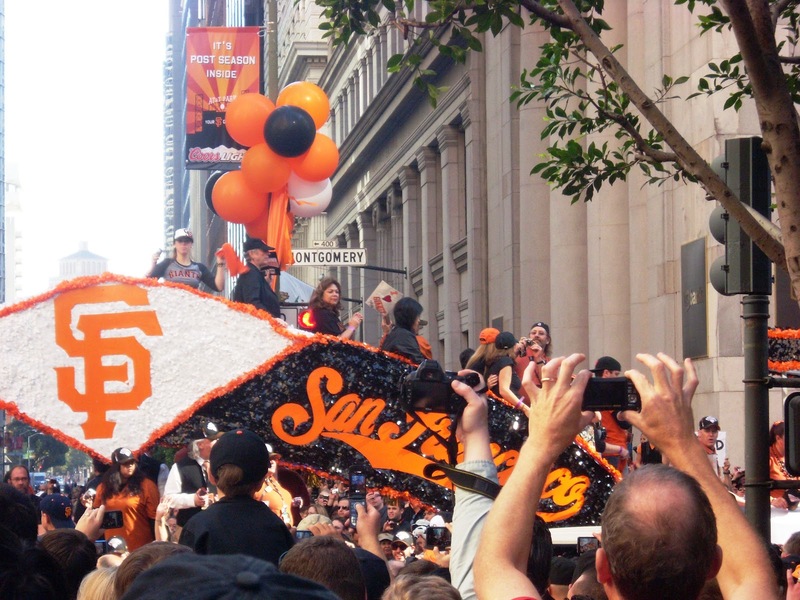 The streets were decorated with orange and black, and people were emotional. I even got a little teary, though I couldn't tell you why. It's like crying at a surprise party - I just do it. At the time I was feeling quite emotional, because while San Francisco was celebrating a victory, I was finishing Harry Potter and the Deathly Hallows. Each night I was travelling on an emotional rollercoaster, and when I finished the ride I was bereft. But back to Pier 23 and the high spirits. We sat outside and I sighed a lot, thinking of my impending journey to Miami. I was taking the red eye flight that night, to meet friends in the morning. There was a potentially awkward meeting taking place the next day, and I was dreading it. While I was dying to meet my friends (see how the friend count is rising?) I really didn't want to leave San Francisco. But Gaynor was about to go and work the night shift in her bar, so I really couldn't complain. Instead we had good beer and a good laugh. She also introduced me to a food that has haunted my dreams ever since: ceviche. I'm not sure I'd ever heard of it before then. 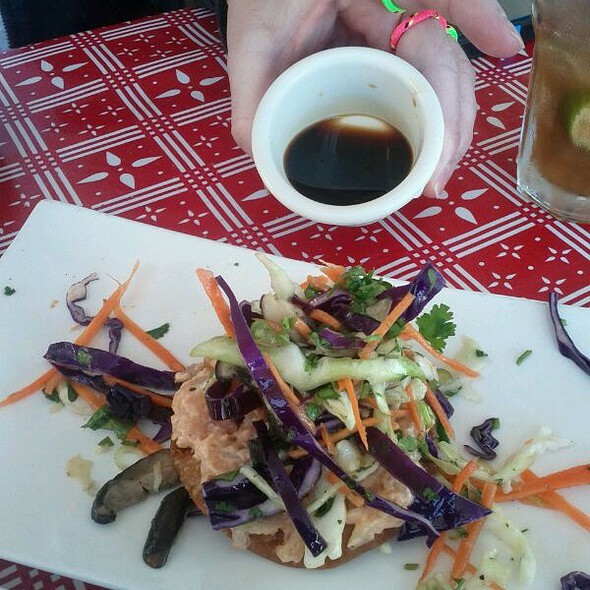 It's tiny cuts of raw fish, marinated in lime or a similarly acidic citrus, which 'cooks' the flesh before it's mixed with bits of veg, and served on a tostada. On consultation with the online menu though, I've discovered what I actually ate is a tuna poke, which is the Hawaiian version of ceviche. The essence is the same, though the Hawaiian version incorporates soy sauce. Now, I'm sure there are a million places to eat ceviche in San Francisco, but as this was my first ever tasting, it holds a special place in my heart. It's fresh, punchy and tastes like the ocean. I loved it. Since then, it's become one of my favourite meals to make at home. The recipe I use is taken from one of my favourite blogs, Recipe Rifle. Her original recipe is here, and I've made a few changes according to my personal taste (which is probably pretty bland and boring). Esther uses monkfish or seabass, but I prefer tuna. I should experiment with it, but... I haven't. 3. While you're waiting for the tuna to 'cook', dice the red onion into small chunks, and chop the avocado. 4. Drain the lime juice off of the tuna, but don't rinse. The fish should be translucent, light pink in places. I don't season the fish, because I find the nachos provide enough salt, and pepper overpowers the dish. But I am also not a chef. Everyone else in the world adds chili and coriander, but I believe coriander to be the devil's work, and I'm not a fan of strong heat. So I don't bother. This is enough to serve one as a dinner, or two for a starter. It's one of those things that tastes great eaten outside, with a cold bottle of beer and the sun on your face. But rest assured, it's just as good when you're slumped on the sofa watching 30 Rock.